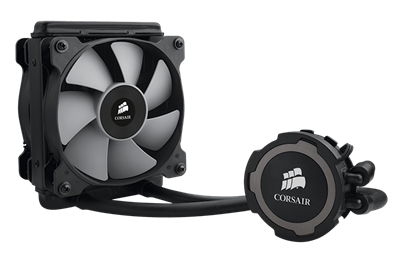 Hydro Series H75 provides effective and efficient liquid CPU cooling in a compact size. The 120 mm radiator has a thickness of only 25 mm and is paired with standard diameter, kink-resistant tubing for compatibility with smaller cases and tighter spaces. The dual SP120L 120 mm fans support PWM motherboard fan headers, so your motherboard can automatically control fan speeds based on CPU temperature. The tool-free mounting system has broad Intel and AMD socket compatibility. A copper microfin cold plate and high-quality ceramic bearing pump help provide reliable, low-noise heat transfer away from your CPU. And, like all Hydro Series liquid CPU coolers, Hydro Series H75 is completely self-contained and never needs filling or maintenance. The reliable pump mechanism is designed for silence.